(C) Copyright 2008, 2016 Seriss Corporation. All rights reserved. (C) Copyright 1995,2000 Greg Ercolano. All rights reserved. 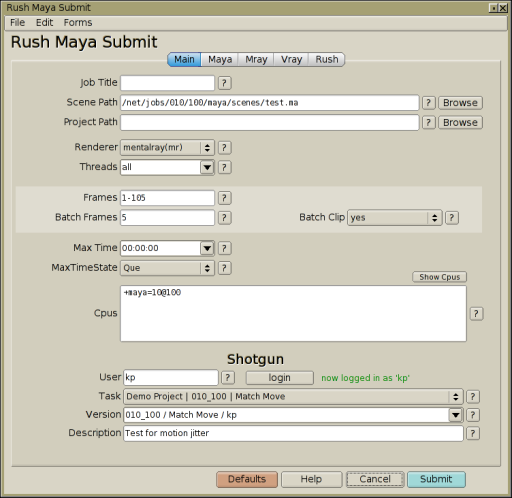 The python submit scripts (submit_maya.py, submit_nuke.py, etc) can also be used as cgi-bin scripts to allow submitting jobs via URLs to an Apache webserver. See details in the rush/examples/python/README-web-submit.html file for info on how to configure. Irush using new black color theme. Here's how to enable it. 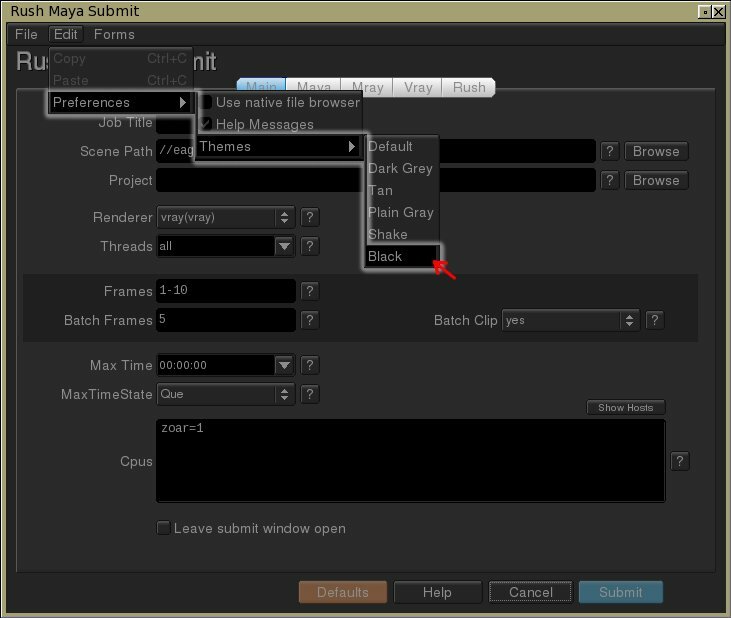 Submit forms using new black color theme. Works for both perl and python submits. The column headers in all the reports have been improved to look a bit nicer and more consistent with other applications. You can click on the headings to sort by that column as usual; cycles through sorting ascending/descending/no sort. To resize columns, click on the separators between columns in the heading area to make them wider or smaller. 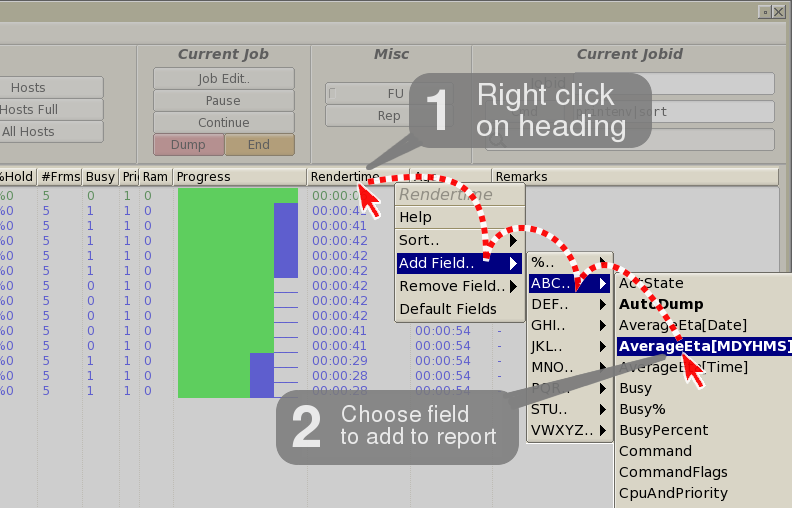 (1) First right click on a heading you want to add a field to the right of, then (2) choose 'Add Field' to find the new field heading you want to add..
(3) The new field will now appear in the report. You can add as many fields as you want this way to define custom reports. Later you can use 'Remove Field' to get rid of fields, or 'Default fields' to reset the report to defaults. These field settings are saved in your home directory's "~/.irush-fmt" file, which you can also manually edit to make changes. New fields have been added to the default Jobs and All Jobs reports to help render wranglers and artists better manage jobs. New right click menus offer an alternate way to do operations in irush on selected lines in reports. 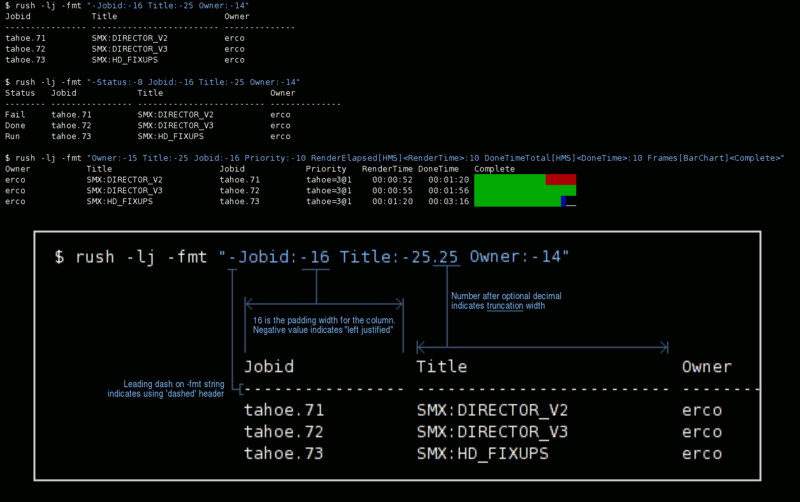 Makes long job commands easier to read and manage. 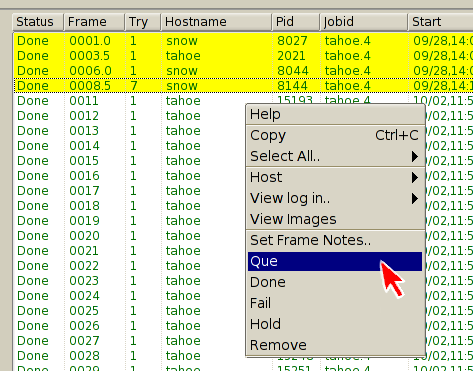 These environment variables are passed from irush to any custom Hotkey scripts so that they can determine which jobs/frames are selected in either the "Jobs" or "Frames" reports of irush at the time the Hotkey script is invoked. 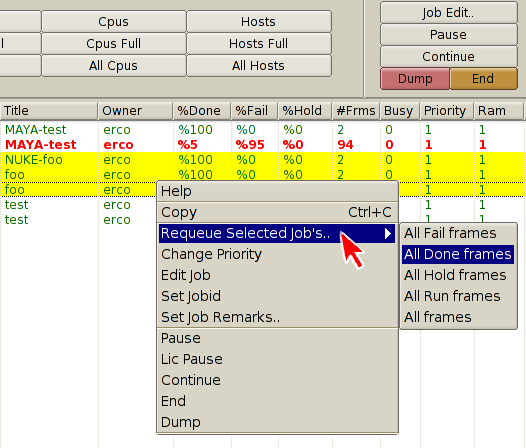 The scripts can then operate on the selected jobs/frames accordingly. Truncation indicators appear when a column's size is too small to show data, and the data is being truncated. This helps prevent any confusion about whether a field is being cropped. 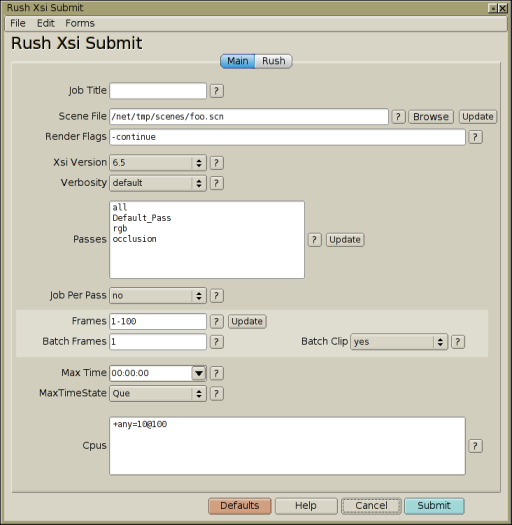 In Rush 103.05, Rushtop got some attention to improve its interface useability. A new bar has been added to rushtop that shows network I/O of each machine in bytes per second in and out of the machine. 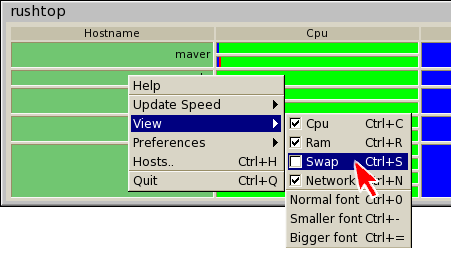 Shows in/out network interface traffic relative to peak traffic. You can enable/disable any of the columns of data using the popup menu's new "View" submenu. The new 'View' submenu in rushtop. These can also be changed from the rushtop command line with the new '-view' parameter. People with large hi-def screens will want this feature; lets you enlarge the interface's fonts to be easier to read on large screens with tiny pixels. If there are columns of information in rushtop you don't want to see, you can turn them off using the popup menu's new "Hosts.." dialog, which lets you pick the hosts you want to see. 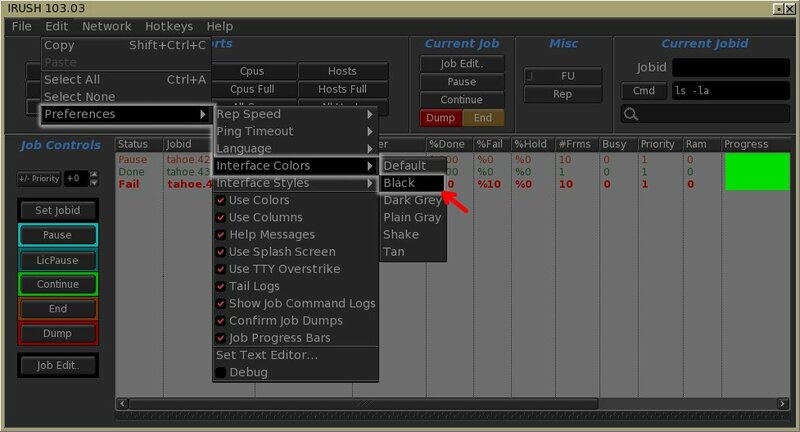 You can do 'swipe' selections, use ^A to select all, and use Ctrl to toggle items. The right-click popup menu's new 'Hosts..' option brings up a dialog to let you choose which hosts to monitor. This feature has actually always been available from the rushtop command line; you can simply specify hostnames or +hostgroups on the rushtop command line to set which machines to view, but now the feature is available from the GUI's popup menu as well. In cases where machines don't have IP lookups, rushtop shows these errors in the bar for that host, making it easy for admins to see hostname lookup problems. Hostname lookup errors show up within rushtop. 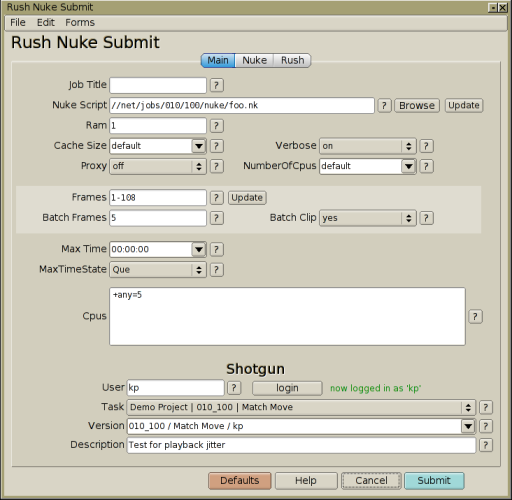 There are now separate Python submit scripts that include optional Shotgun Software ® support. These scripts can either be run as standalone apps, or import'ed directly into Maya, Nuke, and other renderers that support Python internally. 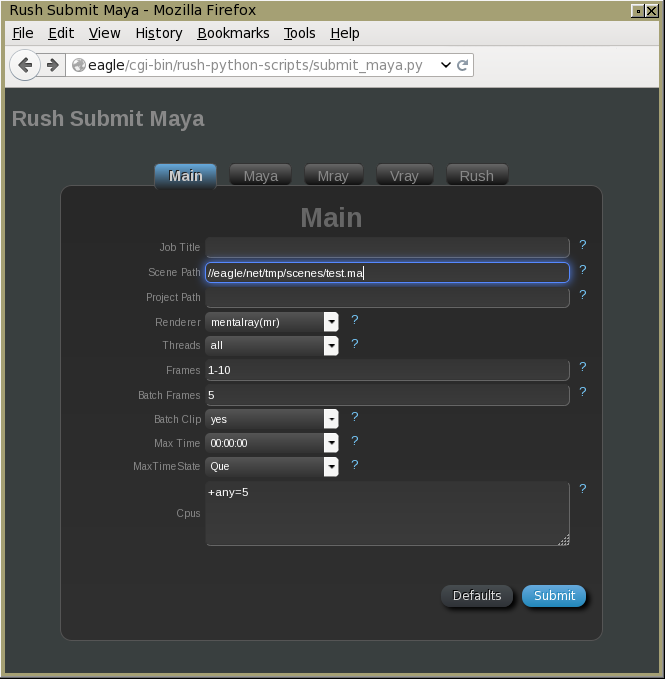 There is also a growing Python API modules for Rush so that your own scripts can import these modules to load job/frame reports and manipulate jobs. These two scripts had been floating around for years via email support, but was never added to the mainstream release until now. 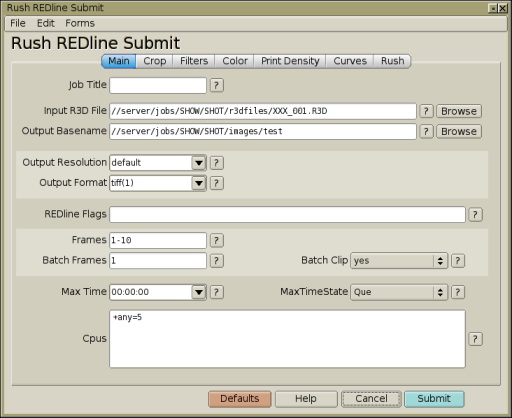 The submit-xsi script supports all versions of Xsi to date, and the submit-redline script supports the Red camera's R3D file conversions. 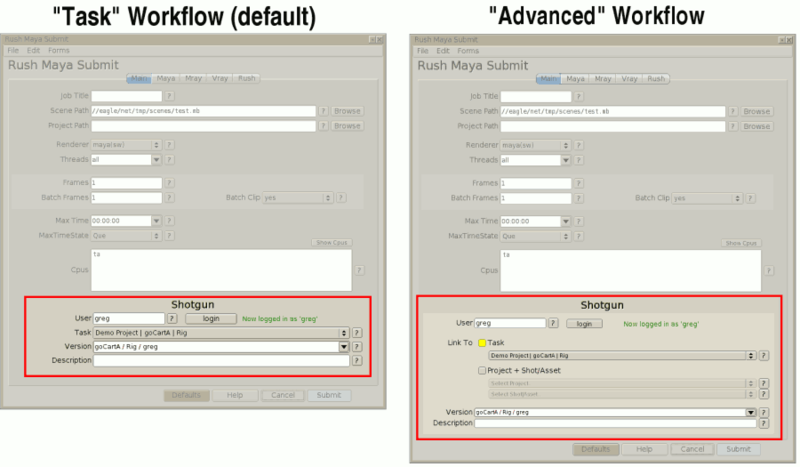 Your Shotgun administrator controls whether Rush (and shotgun) uses Shotgun's "Task" workflow, or the more generalized "Advanced" workflow via the shotgun_io.conf file (typically located in the same directory tree as the shotgun_io.py script). There was a network packet size limitation that affected large 'rush -laj' reports caused by some network switch/OS combinations which has been fixed by implementing fragmentation size control via the rush.conf file, allowing for much larger reports. 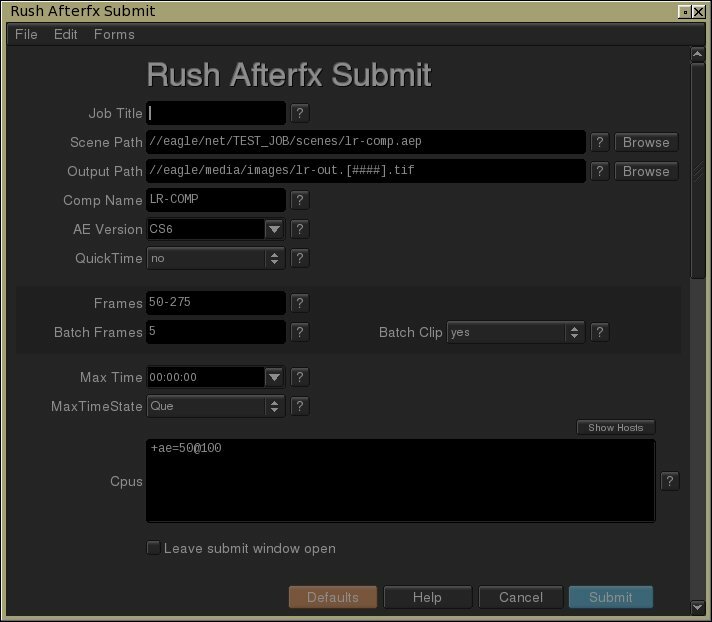 Rush has already supported affinity for several years for Windows, and now linux support has been added. Every rush job now maintains 'change counters' which are incremented whenever an aspect of the job has changed. 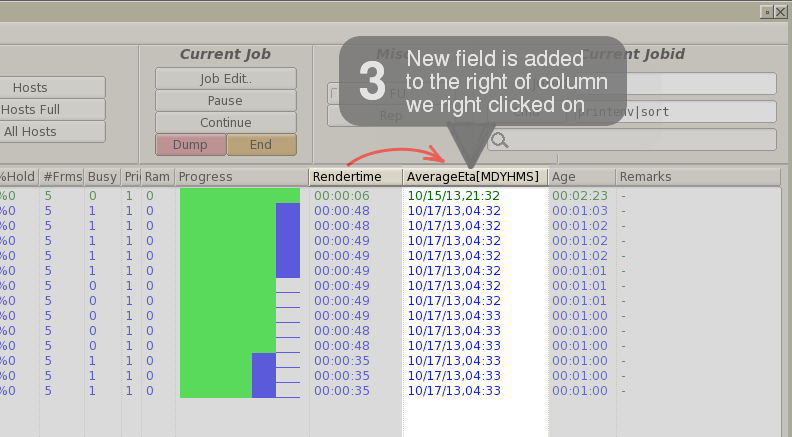 GUI applications can view these counters for all jobs quickly with a single low load/low bandwidth 'rush -ljc' command to see which jobs have changed, preventing the need to poll ALL data about jobs. This feature can be used by 'watcher scripts' as well, to easily see which jobs have changed for custom load balancing, so that it can know if that job's info needs to be reloaded to update the watcher's cache. The sysadmin can configure the new cpuacct.dbasedir rush.conf command to tell Rush the path to a file server where all the Rush daemons can append cpu accounting logs. e.g. This feature can be used by custom scripts, and will also be used by future web based scripts included with Rush that can easily provide network wide utilization report graphs in realtime, e.g. done       -- (jobdonecommand only) runs command only if all frames are "Done"
fail       -- (jobdonecommand only) runs command only if any frames are "Fail" and rest are "Done"
donefail   -- (jobdonecommand only) runs command only if all frames are "Done" or "Fail"
See 'rush -lj -fmt help' for the large list of all the possible field names.